ICO, the International Commission for Optics awards annually the "ICO Prize", the ICO Galileo Galilei Award and the ICTP/ICO Gallieno Denardo Award. The latter was established jointly with the "Abdus Salam International Center for Theoretical Physics" (ICTP). ICO also awards annually the IUPAP prize in optics. ICO Prize: Annual deadline April 15th. ICO Galileo Galilei Medal: Annual deadline April 15th. IUPAP Young Scientist Prize in Optics: Annual deadline April 15th. ICO/ICTP Gallieno Denardo Award: Annual deadline December 1st. donated by the Carl Zeiss foundation. ICO established in 1982 the ICO Prize, to be given each year to an individual who has made a noteworthy contribution to optics, published submitted for publication before he or she has reached the age of 40. (Specifically, the Prize winner must not have reached the age of 40 before December 31 of the year for which the Prize is awarded). The character of the work of successive Prize recipients should preferably alternate between predominantly experimental or technological and predominantly theoretical. The "noteworthy" contribution in optics is measured chiefly by its impact (past or possibly future) on the field of optics generally, opening a subfield or significantly expanding an established subfield in research or technology. a cash award of an amount established in the triennial budget of ICO, and the invitation to present an invited paper and receive the award at the next ICO Congress or another ICO meeting mutually agreed to by the bureau and the award winner. Every year, the ICO Prize Committee issues a call for nominations that is published in the ICO Newsletter, receives the nominations and selects the recipients for approval by the Bureau at its next meeting. The award needs not be made each year if the Prize Committee so chooses. The Prize is preferably given to an individual, but it can be shared by two persons. Eligibility for the Prize is not excluded by previous prizes awarded to the individual. The selected Prize winner is then announced in the ICO Newsletter and, as appropriate, in one or more optics journals. The prize will be presented at the next appropriate major ICO meeting and the Prize winner will be expected to deliver an invited talk at that Meeting. Posters of the Prize are also available under request to ICO Secretariat. The cash award presently carries an amount of US$2000 and US$1000 for travel expenses. In addition to the rules adopted by ICO, the Carl Zeiss foundation has generously agreed to donate an Ernst Abbe medal to the winner. 1984: J. Christopher Dainty, U.K.
1988: no prize bore the number of the year 1988. In 2005 the International Union of Pure and Applied Physics (IUPAP) created the Young Scientist Prizes for its commissions. The international Commission of Optics (ICO), as an Affiliated Commission of IUPAP, decided in 2008 to adopt the IUPAP Young Scientist Prize in Optics. The IUPAP prize in optics will be awarded annually through ICO to a scientist who has made noteworthy contributions to applied optics and photonics during a maximum of 8 years of research experience after having earned a PhD degree. Career interruptions will not be counted as time of research experience. 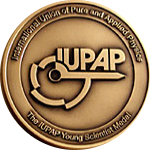 The IUPAP Young Scientist Medal with the name and discipline (optics) of the awardee engraved on the back. A 1000€ award as established by IUPAP. The Prize is awarded at a major ICO meeting, where the recipient is expected to deliver an invited presentation. 2010: Shuang Zhang, United Kingdom. 2016: Laura Na Liu, Germany. The ICO Galileo Galilei Award contributes to one of the essential missions of the International Commission for Optics: recognize the promotion of Optics under difficult circumstances. The award was established by the 1993 General Assembly of ICO and has been awarded annually since 1994.
a) the Galileo Galilei Medal, a silver medal with the portrait of Galileo Galilei donated by the Italian Society of Optics and Photonics, SIOF (Società Italiana di Ottica e Fotonica). 1994: Ion N. Mihailescu, Romania. 1995: Rajpal S. Sirohi, India. ICO, the International Commission for Optics, and ICTP, the Abdus Salam International Centre for Theoretical Physics, Trieste, have agreed to establish a joint prize, called the ICO/ICTP Award. It is reserved for young researchers from developing countries (as defined by the United Nations), who conduct their research in a developing country. The award will be given to scientists less than 40 years old (on December 31 of the year for which the award is given), who are active in research in Optics and have contributed to the promotion of research activities in Optics in their own or another developing country. While this web site has complete information, the following should be appropriate to prepare a nomination. The ICTP invites the winner to attend a three-week-long Winter College at Trieste at the next appropriate opportunity, and to give a seminar on his/her work when appropriate. ICTP will pay for travel and living expenses. The award will be presented to the winner at Trieste in the presence of representatives of ICO and ICTP. The award is given to one person every year. The winner is selected on the basis of nominations received by the Award Committee in response to a call published by both ICO and ICTP. The nominations must be documented with a complete curriculum vitae including a list of publications and selected reprints (no more than three) as well as a complete employment history and a description of the nominee's achievements for the promotion of research activity in developing countries. In September 2007, the ICTP and ICO agreed to define the ICO/ICTP Award as ICO/ICTP Gallieno Denardo Award to honor the memory and legacy of the late Prof. Gallieno Denardo. The ICTP invites the winner to attend a three weeks Winter College at Trieste at the next appropriate opportunity, and to give a seminar on his/her work when appropriate. ICTP will pay for travel and living expenses. 2001: Arashmid Nahal (Iran) and Fernando Perez Quitian (Argentina). The Award Committee is chaired (for the term October 1, 2017 - September 30, 2020) by Prof. Mourad Zghal, University of Carthage, Tunisia. e-mail :mourad.zghal@supcom.tn. Other members of the Committee are Prof. A. Consortini of University of Florence, Italy; Dr M. Danailov of Syncrotrone Trieste, Italy; Prof. J. Niemela of ICTP, Trieste, Italy,; and Prof. A. Wagué, University Cheikh Anta Diop, Dakar,Senegal. Nominations are to be sent to the Award Committee Chair, Prof. M. Zghal, with copy to Prof. Joseph Niemela, Abdus Salam International Centre for Theoretical Physics, ICTP, Strada Costiera 11, 34151 Trieste, Italy, niemela@ictp.it. Nominators are encouraged to generate supporting letters; each supporting letter must come from a different country or ICO Territory and bring additional information on the case. The number of supporting letters will not be a selection criterion. The recipient will be expected to give a presentation based upon his/her achievements at the next appropriate ICO Meeting. The ICO/ICTP Gallieno Denardo Award winner will be expected to give a presentation at the next appropriate ICTP/ICO event.